Are you still exfoliating with scrubs? 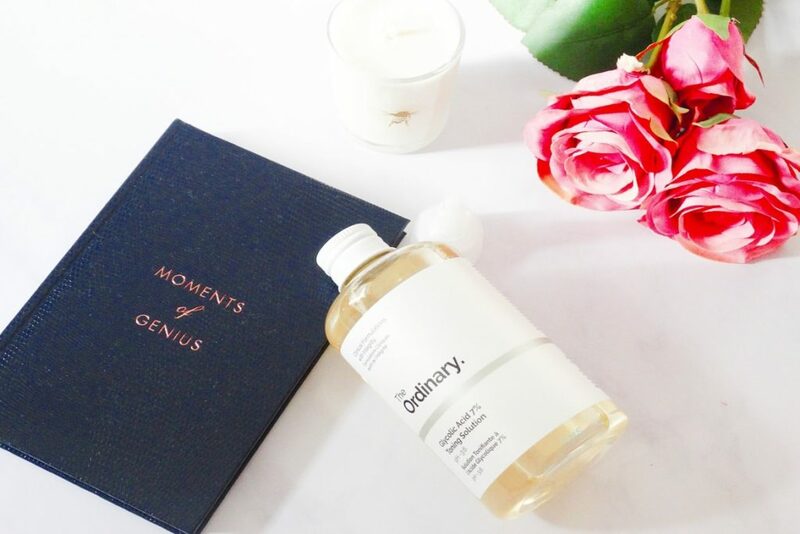 It’s time to switch things up and give glycolic acid a try. I know, I know, scrubs can be addictive. But so can glycolic. I’ve never met anyone who made the switch and went back to scrubs. Glycolic acid is an exfoliant on steroids. It gets rid of dead skin cells, hydrates your skin and keeps wrinkles at bay. Can your scrub keep up with that? What The Heck Is Glycolic Acid? Glycolic acid belongs to the alpha hydroxy acids (AHAs) family, a group of exfoliants derived from milk and plants. You’ll find glycolic acid in sugar cane. But the type used in cosmetics is usually made in a lab. Glycolic acid is the most famous member of the family. That’s cos it’s the smallest. It can easily penetrate your skin so it works better and faster. Glycolic acid’s main job is exfoliation. It works by dissolving the glue that holds skin cells together, so they can slough off. This top layer is the most damaged. These cells have become dull and rough. Darker even. Once they’re out of the way, your skin looks smoother, brighter and more even-toned. Your dark spots slowly fade away. Wrinkles look smaller too. Your whole complexion glows. “Ungluing” dead skin cells is a much better way to get rid of them than manual exfoliation. When you scrub your skin with sugar, apricot kernels, or plastic microbeads, you may spend a few seconds more on one area and less on another. You may remove more dead cells, let’s say, on the forehead and fewer on your cheeks. Plus, they can irritate skin. Apricot kernels are the worst culprits but anything with rough and jarred edges can scratch skin. Spend a few seconds too long on one area and it’ll get all red and irritated. Compare that with glycolic acid. You apply that all over, getting a more even and precise exfoliation WITHOUT lacerations. Related: Physical VS Chemical Exfoliation: What’s The Difference? If better exfoliation alone isn’t enough to make you switch, how about this? 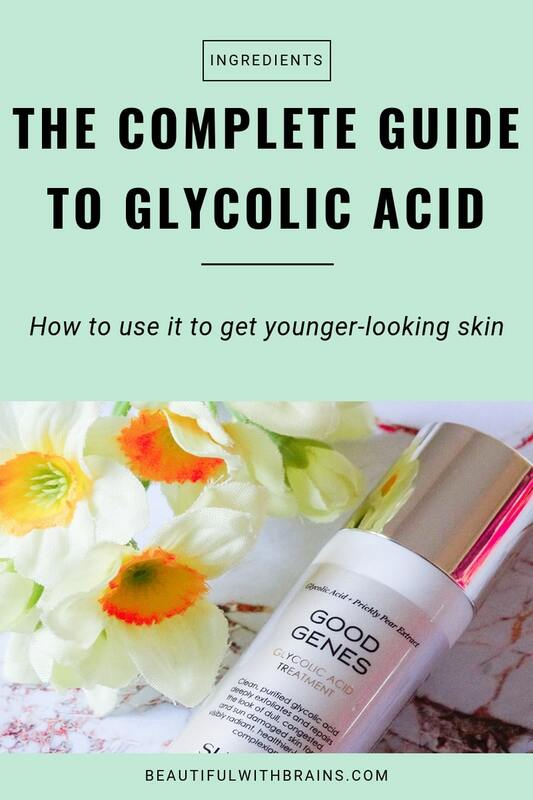 Glycolic acid can make you look younger. Scrubs only remove dead cells from the surface of your skin. That’s it. Glycolic acid goes the extra mile. It boosts collagen production, too. Collagen is the protein that keeps your skin firm and elastic. The more collagen your skin has, the longer it keeps sagging and wrinkling at bay. Scientists think this is how glycolic acid helps reduce the fine lines and wrinkles you already have, too. Glycolic acid moisturizes skin, too. This acid increases the levels of hyaluronic acid in the skin. 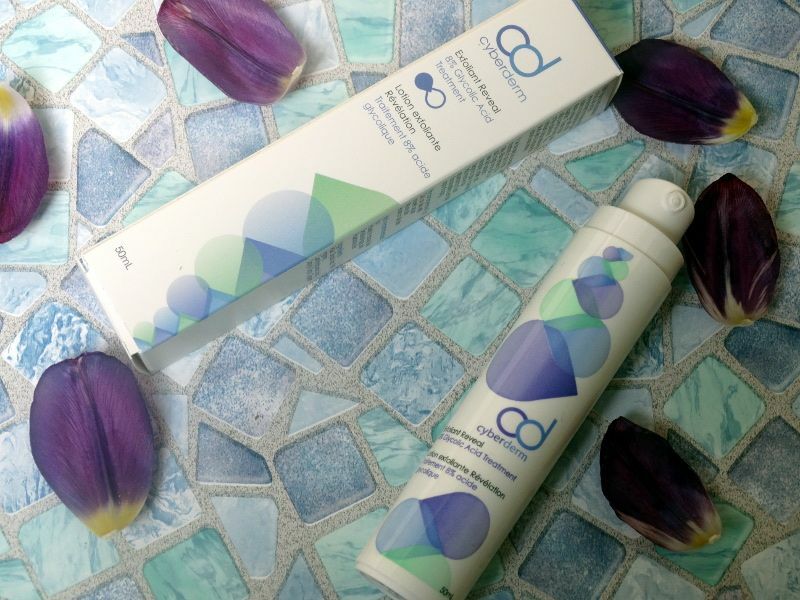 Hyaluronic acid is a moisture magnet that can hold 1000 times its weight in water! Once your skin has all that moisture, it stays soft all day and looks plumper, too. Sounds Great! Where’s The Catch? Here goes: glycolic acid can increase skin’s sensitivity to the sun. In other words, you’re more prone to get sun damage if you use glycolic acid. Kinda ironic since it can treat it too, isn’t it? One more thing: high concentrations can cause irritations. Start small and work your way up. Who Should Use Glycolic Acid? Dry skin: it exfoliates and hydrates at the same time. Mature skin: it exfoliates and fights wrinkles at the same time. Oily, acne-prone skin: opt for salicylic acid, an exfoliant that unclog pores from within. Sensitive skin: glycolic acid may be too harsh for your skin type. Related: AHAs VS BHA: Which One Should you Use? How Much And How Often Should I Use It? If you want fast results, you need to get peels. They use between 20-70% glycolic acid but they’re super harsh on the skin. Don’t even think of buying them from Amazon. You can seriously destroy your skin. Save yourself the pain and go to a professional. OTC concentrations are much lower (<15%) so they work more slowly. They can irritate skin too but not as severely. Still, start small. Use 5% a couple of times a week and slowly increase both dose and frequency. FYI, while we’re on the subject, don’t bother with cleansers with glycolic acid. Glycolic acid needs to stay on the skin for hours to work its magic. Rinse it down the drain and you won’t see much of an improvement. Related: Do Exfoliating Cleansers Work? What Are The Best Products With Glycolic Acid? 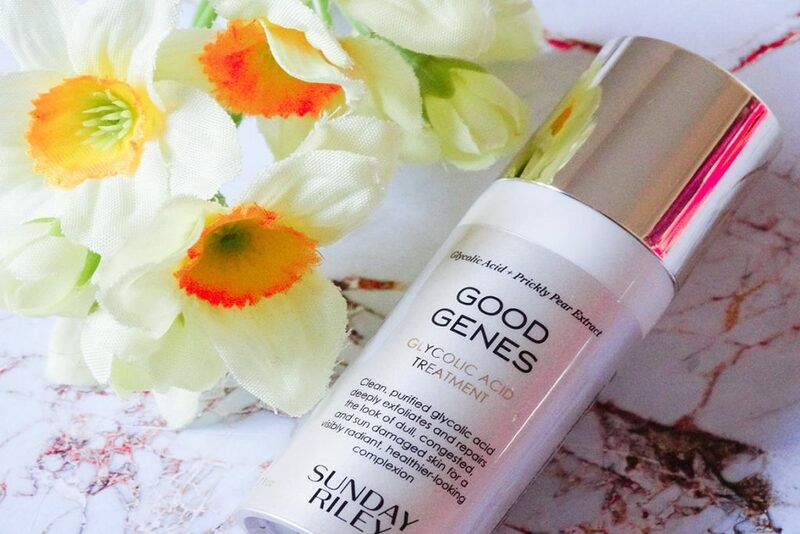 Glycolic acid is an antiaging superstar. It exfoliates, hydrates, brightens, fades dark spots and wrinkles and even boosts collagen. Find a scrub that does all that! Are you ready to make the switch to glycolic acid? Share your thoughts in the comments below. I’m currently using one by DDF. It’s their ‘10% glycolic exfoliating oil control gel salicylic acid 2% ace treatment’. What a mouthful to say but that’s what’s written on the pump bottle. I use it every few nights instead of retinol and sometimes during the day when I’m not outdoors much. I don’t trust some skincare on Amazon. I used to order my vitamin C serums there and I occasionally still do, but a few of the brands seem to have fake reviews. Like I never even heard of them a month before and they now have a few hundred reviews? It just seems odd. I could be mistaken though. Janessa, oh the power of a good scent. When something smells that good, it’s impossible not to use it. Could it be that they’re bloggers’ reviews? I know on Goodreads a lot of people write reviews of books before they come out. They get an advanced copy from the publisher who hopes to attract interest in the book. Not sure if those brands use the same tactic. But if they are small and unknown, it’s always best to err on the side of caution. You never know. Some may get friends to write fake reviews. I’ve read AHAs are pH sensitive and that it’s crucial to make sure products containing them are between pH 3 and 4.5. Any truth to this and if so, is there any way to determine whether a product falls within this range? Vanity, yes, that’s true. Unfortunately, it’s often impossible to determine the ph of a product. You could do a test using ph strips. Or, sometimes, a product contains ingredients that work well at a basic ph and others at an alkaline one, so you know that something is off. 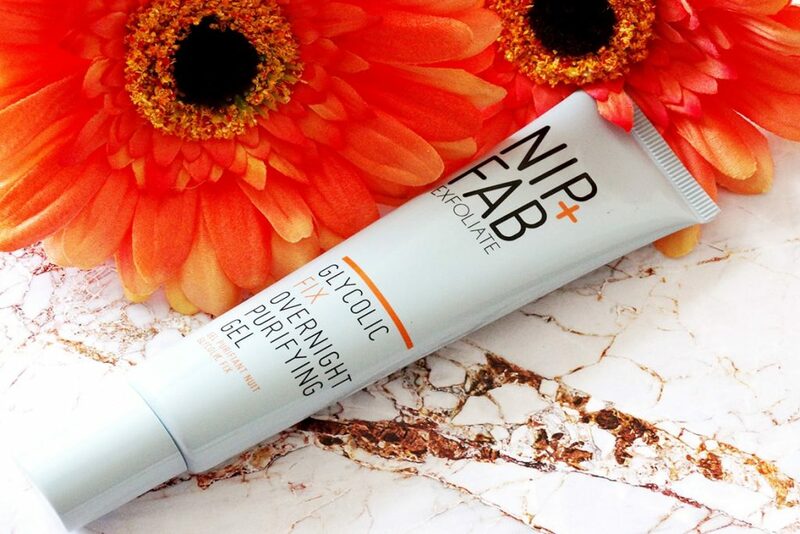 I love Glycolic and swear by it! I’m a few weeks away from my 40th birthday and most people place my firm, wrinkle-free face in the first half of my 30s. I always thought I’d be buying myself botox or fillers for my 40th, but no need 🙂 I’ve been using glycolic acid since my 20s. Hi Sage, may I ask what concentration of Glycolic acid you have been using? First off, I am grateful to you for all the advice. I am a 26 year old male and am considering starting Paula’s choice 8% AHA. Using it daily in the morning followed by SPF. Q1) Do you think its too early an age to start? Q2) I know my skin can tolerate 8% AHA daily. Is daily use too frequent? SK, I think it’s great that you want to start taking better care of your skin. And nope, 26 is definitely not too early too start. And that depends. If your skin can tolerate it, then there’s no reason why you can’t use it daily. I like to ask if I can use the glycolic mosituriser of Thomas Peter Roth on my eyes area. My eyes area are extremely dry. Will it be too harsh? Xy, you won’t know until you try it. but yes, that’s a possibility. I have been reading your blog and understand that mosituriser are good enough for the under eye as well. But I ended up buying the glycolic gel which is suitable for all skin types instead of the mosituriser. I find the gel not mositurisering enough. I will try the cream one next. The thing is it stated on the bottle to avoid with eyes and mucous membranes. Not so sure what it meant. I did apply a thin layer under my eye, so far not much of adverse effects. Such a pity you don’t do reviews on Korean or Japanese products. I’m from Asia and it’s very popular here. XY, I find most creams and gels say “not suitable for the eye area”, yet they contain the same ingredients as eye creams! As long as they don’t contain fragrance or any other irritating ingredients, you can safely use them. There is a very affordable brand with good AHA options. It’s Alpha Skincare, formerly known as Alpha Hydrox. It gets high ratings on.Beautypedia. Sherry, thanks for sharing. I think I tried one of their products and it was very good indeed. The only thing I’m concerned about is indirect premature ageing caused by exfoliation which speeds up the skin’s renewal process. Apparently a skin cell itself ages and the number of times it renews itself is the way it ages. I wonder if there is a bigger price to pay later. The best EVER article I have EVER read about glycolic acid. You sum it all up beautifully. Thank you! I am subscribing to your blog. My understanding is it glycolic acid is not chirally correct and can have a damaging effect on skin over the long-term. Can you please address this issue of chirality? Thanks so much! I just spent a boatload of money on glycolic acid and a variety of other products by dr. Dennis gross (before I found your blog) do you know anything about his products or have you ever done a review? Kate, I find it to be a good line most of the time. I’m a big fan of the Retinol + Ferulic Acid serums for eyes and face but their exfoliating products use a bit too much alcohol for my liking. Having said that, if you apply a good moisturiser afterwards and don’t have sensitive skin, the alcohol content likely won’t be a problem. Great info, thank you! I’m excited to try one of these. I too have used scrubs in the past. This may be a silly question- but if you use glycolic do you still need a manual exfoliant – or will the dead skin dissolve naturally when washing your face? Detailed read on glycolic acids!Thank you! I’m very new to these acids.. I have combination to dry skin..occasional breakouts, but loads of stuborn blackheads here and there..I’m 32 and would like to know if it’s ok to start off with 5% glycolic acid toner.. would it help? Unlike salicylic acid, glycolic acid won’t get inside the pores and unclog them from within. So try salicylic first and, once the blackheads have disappeared, you can switch to glycolic. Hi. I’m 27 and I apply a glycolic acid serum every night and I was wondering, should I also start retinol? I keep reading that it’s an essential part of a nighttime skincare routine but how is it different from glycolic acid. Do I need it or is glycolic acid enough? If you think it’s essential that I start using it, how should I incorporate it into my nighttime routine considering that I also use glycolic acid, and what are the best products in your opinion? Sorry for all the questions and thanks! Meg, retinol (and all forms of vitamin A) is the only thing that’s proven to reduce wrinkles once they’ve appeared. It also boosts collagen production, preventing them in the first place. If you’re serious about anti aging, you should add it to your skincare routine indeed. Hi! I’ve been using a moisturizer with Glycolic Acid copolymer. Does it have the same potency as Glycolic Acid? And does it cause sun sensitivity? I’ve only been applying sunscreen in the morning under my makeup. I’m wondering if that’s enough protection? Shauntel, if you’re applying the recommended amount of sunscreen (about 1/4 teaspoon for the face), it’s protection enough. It’ll exfoliate your skin without side effects. Hello, first thank you for so much information on glycerin acid. It was actually difficult to search for info about it that was not from generalized websites that lack more depth about it. After reading the 2 articles linked here, I want to know if PHAs and BHAs also can be safe for daily use without shortening the Hayflick Limit on our skin? Having said that, I wouldn’t use any exfoliant every day unless my skin were really oily and resistant. Dead cells are there for a reason: to protect the raw skin underneath from sun damage, pollution etc. If you exfoliate daily, you may remove too many dead cells and irritate your skin. Hi! I have a glycolic acid toner. Can I use with vitamin C serum? Does the order matter? KR, that could be too irritating. Use Vitamin C in the morning and glycolic acid at night. Thank you for the interesting article and informative comments. I am 41, normal – dry skin. Never used glycolic acid. Do you think 10% pads could be a good start to reduce pores and even wrinkles like crow feet, frown and smile lines? Would you suggest any brand? Sam, I’d start with 5% and see how your skin takes it before upgrading. 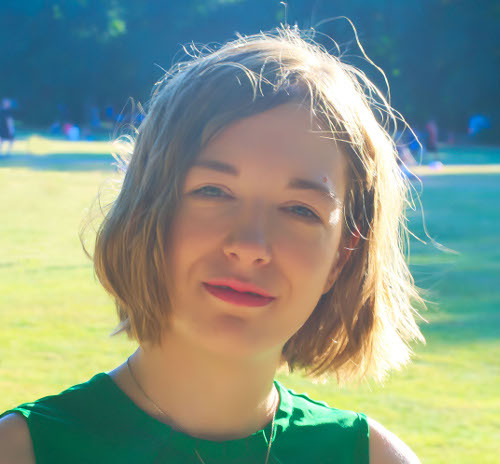 A common mistake with exfoliation is that people use higher concentrations or exfoliate every day to get faster results… and it massively backfires! Overexfoliation just irritate skin and it can take a while to recover from it.